Night stay at Kolkata was decent; we ordered chicken noodles in the middle of the night. The city is still as unclean as it was 10 years back, accompanied by very high entropy. The airport is medieval (note: aviation history starts much after Christ) & even Emirates does not get an aero-bridge. 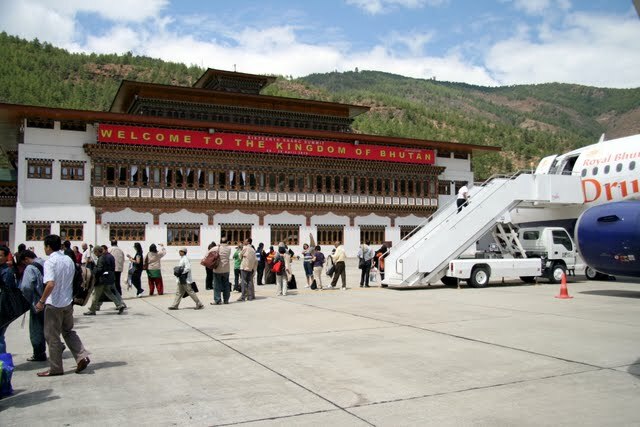 Took an early morning Druk Air flight to Paro; the airline operates a fleet of 2 A319s. I was sitting next to Pema Tshering, a unique scholar who teaches History to MA students & Geography to BA students. He was kind enough to offer me his window seat & introduce me to the Himalayas. The approach to Paro requires a 90 degree turn between the Paro valley to show way to a really small runway; surprisingly there are no taxiways either.